The next regularly scheduled troop meeting will be this Friday, January 2, 6 – 7:30PM, inshaAllah. Brownies have voted for their new crest. Bees symbolize hard work — and having fun while you’re doing it. Buy it online or at your Girl Scout shop. We may have a few at the meeting for $1.50. The dress-up Rainbow Tea Party has been rescheduled to January 16, inshaAllah. All WOW journey pages need to be completed to receive the badges. Pages 77, 84, 85, 99, 106 – 109 were assigned last week. Pages 56 – 59, 82, 83 were assigned the previous meeting as well as page 29. We will review them after Investiture. For their WOW Action Project, Brownies will be selling blanket throws for $12 each to raise funds to make a charitable donation to assist building wells in an African country through Good Gift Foundation. Drawing Badge Workshop on Jan 10. There were 10 girls at the last meeting so 10 should be ready to present. We will rethink the MEdia weekend due to the lack of participation in the aMaze journey. Overnight Lodge Camping, Feb 13 – 15. Last day for payments is January 16. Please pay troop dues for your girl(s). The next regularly scheduled troop meeting will be this Friday, December 26, 6 – 7:30PM, inshaAllah. 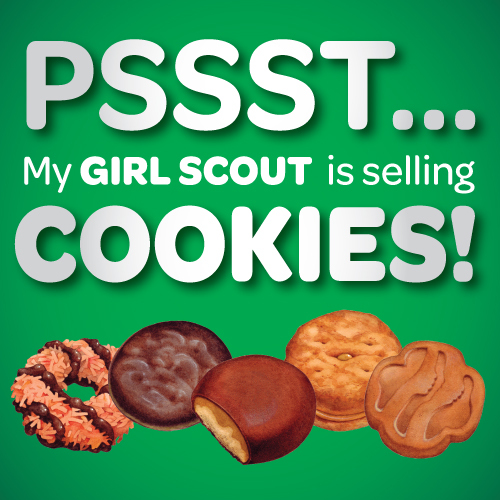 It’s Cookie Season, Girl Scouts! 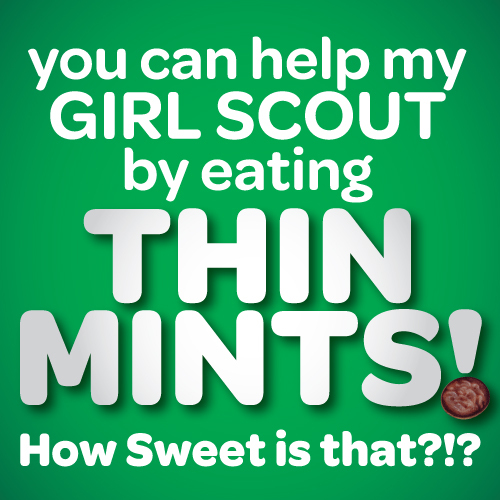 Have you set your cookie-selling goal? Will be packaging and completing blanket throws for action project to be presented on Investiture day. Brownies will have a rainbow tea party for their Investiture & Rededication on January 2. Girls should wear a pretty dress and their vest. Please RSVP and bring $5 this Friday. Copies were sent home for those without journey books. Attendance is necessary to receive journey badges. Turn in the budget for 3-day NYC trip and check register. 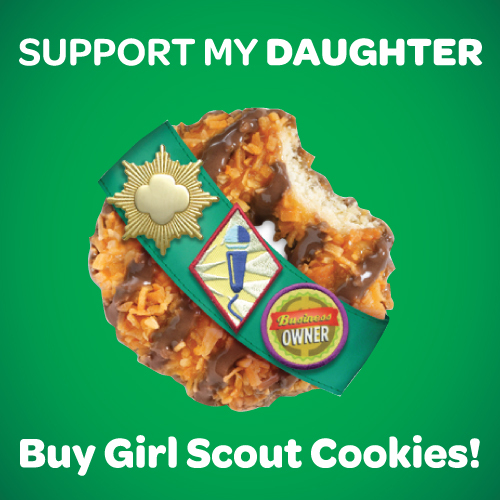 Let the world know that you’re a proud Cookie Mom, Dad or Volunteer! These one-of-a-kind support messages can be shared via social media or downloaded for printing. Post as your Facebook timeline cover or use as your profile pic. Share on Pinterest or Instagram. Tweet it. Click on any of the images below to open the full size image. When you have the full size image open, right click and choose save as. This will allow you to save the photo onto your computer. From there, you can share freely. Jewelry artist Sis. Razia Mateen will be joining the Juniors for their next two troop meetings to help them complete their Jeweler badge inshaAllah! In part one, Sis. Razia will introduce the girls to tools jewelers use and show them samples of her work. Then, the girls will make their own custom necklaces. In part two, she’ll help the girls use African beads to make a bracelet and matching earrings inshaAllah. This Friday, Juniors should bring a box of about 100 colorful paper clips and a roll of coordinating duct tape. Girls can find their favorite color combinations at an office supply store or dollar store. This two-part workshop is $20. We can’t wait to see your creations!